It’s hot in London (BBC says its 26 degress Centigrade, but it feels more like 30 to me), so the good folk at Network Rail have developed a really sophisticated solution to the problems encountered by passengers trying to use the fast ticket machines outside the station. The sun’s rays basically makes the screens impossible to read due to the reflection (I guess, although don’t know). 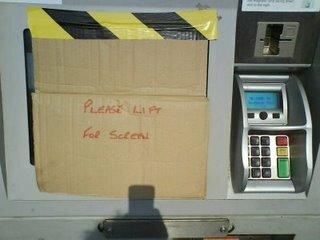 Their solution is a piece of cardboard taped to the machines to protect the screens from the sun’s direct light. This image made me chuckle – it’s good to see the good old ways of British Rail are still alive in its privatised counterpart!